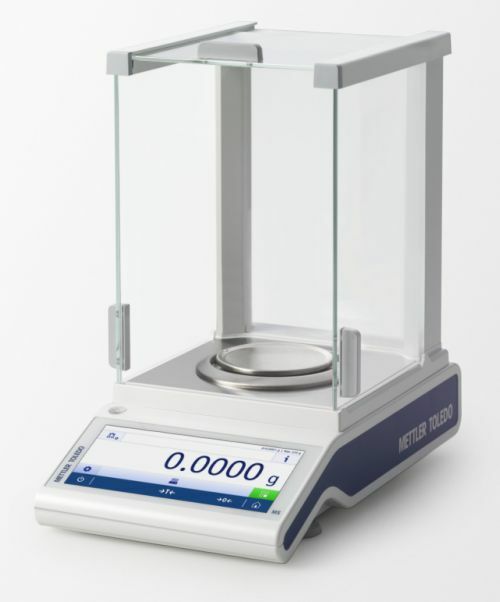 The Mettler Toledo MS304TS analytical balance has a capacity of 320 grams with a readability of 0.1 milligrams and a pan size of 3.54 inches (90 mm) diameter. The MS-TS (touch screen) series of analytical balances brings Mettler-Toledo's impressive MS line to a whole new level. The TS versions feature a huge optimized TFT color touch screen display that is operable even through lab gloves. Standard with the MS line, the TS versions have Mettler-Toledo's renowned high performance MonoBloc weighing cell with ProFACT automatic internal adjustment. All balances in this line have rigid die-cast aluminum housings which improves balance life and stability. The touchscreen interface also has a MinWeigh function, which keeps the weight reading red until it reaches the pre-programmed minimun weight value, and a handy built-in leveling function that guides the user in levelling the balance.